Disclosure: This post includes content sponsored by the Organic Trade Association. As always, all opinions expressed are my own. For more information on the Organic Trade Association, please click here. If you know one thing about me, you know my passion to learn as much as I can about what we eat and how we fuel our bodies. I have spoken a lot about farming, ranching, what scares me, what I love, and what I need to know more about. Recently, I was asked to learn more and share the GRO Organic Check-Off. Honestly, I knew nothing about it, so I took on the task of learning all I could to share my thoughts and opinions with you. This is currently a super touchy subject with me due to the current political climate and my activism on what I believe in. I was pleased to see that back in January, the U. S. Department of Agriculture started seeking public comment on a proposal for a nationwide research and promotion check-off program for organic produce. Although it is now March and we still do not have a Secretary of Agriculture, dedicated civil workers in the agency are still moving forward. From posting pictures of my all organic refrigerator on Instagram to talking a lot about real foods to actually visiting farms, ranches, and producers, I have learned that my experiences have impacted others when I share. But, this places the onus on me to get the facts right and learn as much as I can. Here is what I have learned over the past 2 months researching the Organic Trade Association, how it impacts us personally, and the difference it can make to all of us. Currently, I only bring organic foods and foods I have personally sourced or researched into my home. Yes, out of the home we do eat other food, but we are careful when we can be. I try my hardest to give my family only the purest ingredients and cook with the simplest forms of food out there. I feel that there is not enough information out there for consumers and what is there can be misleading marketing, so we need to be very careful. I also know it’s impossible for everyone to do this for a variety of personal decisions or reasons, which is why I find it my responsibility to educate as much as I can. So, when I was asked to share the Organic Check-Off and how to support the program for others to weigh in on the matter, I raised my hand high! The Organic Trade Association, much like any other association in this field, is there for the consumer. I have worked closely with many food-related associations, including the Soybean Check-Off, so am familiar with their work. I support that the Organic Trade Association needs this in order to better educate, research, and reduce monies being wasted. The Organic Check-Off will protect us as consumers as well as those who provide us with food. What is the Organic Check-Off? In short and in my view, the Organic Check-Off would be a revue-generating source for doing good and in the long run, saving money and lowering the cost of organic foods to consumers. Like all other Check-Offs, the Organic Check-Off will assist farmers in becoming organic, educate consumers, and research and confirm the science out there on the environmental and public health side of eating organics to better distinguish the whole organic/natural blurry line. The Check-Off can work directly with agricultural leaders of the future through grants and scholarships to learn more about organic farming. By combining resources in to one place with better consumer education and consumer marketing, it can provide organics to more people with less money. One example – As published in the Federal Register, the proposal estimates that the Organic Check-Off could raise over $30Million a year to spend on research to assist farmers to become more productive, thus successful in lowering the cost to us. Why Is The Organic Check-Off Needed? First, and most importantly to us as consumers, this is needed to protect and provide us with the cleanest and highest quality food we can get. We need to stop the cycle of eating chemicals. Why are we putting them in our bodies, because most people have to. We, as consumers, need to be provided with proper information and marketing to sort through the rhetoric. We need to know what is truly organic and what is a play on words trying to get us to buy something. We also need to lower the price of organics to be able to supply them and make them more affordable to most consumers. In order to do this, having the Organic Check-Off in place will give the organic producers a strong voice, with farmers holding at least half the voting seats on the board. This will eliminate the “big guys” from taking over. The producers with the passion and hands on experience will have a big say. Who pays for all this? Those who participate in the Check-Off would pay a very small fee. For example, a farmer who has $100,000 in net organic sales would only contribute $100. With current projections, GRO Organic could raise $30 million a year to do good. Will the government help at all? Well, that is our job. 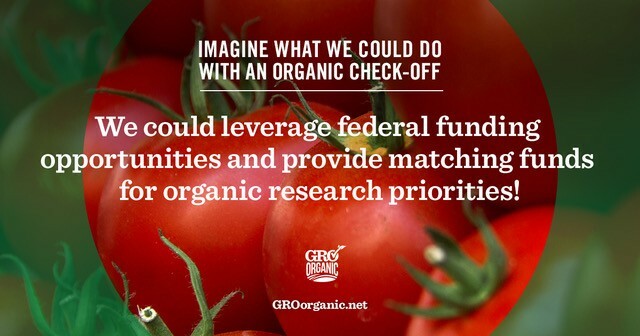 With an Organic Check-Off in place, there are possibilities to get matching funds for research. Can we really get the word out? With an Organic Check- Off, we will have a voice. With the monies raised and everyone supporting one Check-Off, the pool of money and voice will be stronger. Right now, everyone is out there trying to get out the message on their own. But with an Organic Check-Off and everyone working together, there will be one strong voice. If you want to get more information, Mamavacation has a great article on the Check-Off Program with even more detail! Why are organic foods important to you and your family? Would you like to have more access to organic foods? Would you like others to have access to organic foods? Would you like to actually support the organic producers? If you answered yes to any of these questions, please take a minute and leave a comment here. Quick question, who would manage this checkoff program? Would it be USDA? State orgs? Or other? I know there are benefits and drawbacks to both. I work for a checkoff overseen by the USDA and there are vast differences in those that are overseen by orgs and states. Just curious! Jodi- Great question and as you know I am always learning about all of this. Here is the information from their fact sheet. “How would the check-off program be governed? A 17-member industry board, appointed by the U.S. Secretary of Agriculture, would make the decisions on how the funds would be allocated and which programs would be implemented. USDA would sign off on all the plans approved by the board.” After learning about check-offs from you and Jancey I am excited that the organic world may have one too. I always think more information is good, and I could see this doing very good things.